The ‘shadow banking system’ refers to a system of credit-provision occurring outside of the official regulatory perimeter of commercial banks. Facilitated by securitization vehicles, mutual funds, hedge funds, investment banks and mortgage companies, the function and regulation of these shadow banking institutions has come under increasing scrutiny after the subprime crisis of 2007–8. 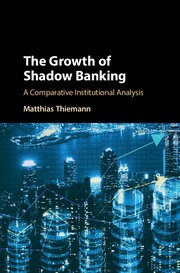 Matthias Thiemann examines how regulators came to tolerate the emergence of links between the banking and shadow banking systems. Through a comparative analysis of the US, France, the Netherlands and Germany, he argues that fractured domestic and global governance systems determining the regulatory approach to these links ultimately aggravated the recent financial crisis. Since 2008, shadow banking has even expanded and the incentives for banks to bend the rules have only increased with increasing regulation. Thiemann’s empirical work suggests how state-finance relations could be restructured to keep the banking system under state control and avoid future financial collapses.